Are you looking for the best Bournemouth auto service for your vehicle? If so, then look no further than S and H Motors. We are the leading specialists in vehicle servicing and diagnostics, so whether you are due an MOT or just want a service for peace of mind, then get in touch with our expert auto service Bournemouth team today. We know how easy it can be to put off booking your vehicle in for a service. The law does not require motorists to service their vehicle, only to get it through an MOT. However, MOTs are only there to ensure your car is roadworthy, and do not necessarily pick up on any underlying issues. S and H Motors provide a Bournemouth auto service that is a reliable and cost-effective way of ensuring your car is performing at its highest level. When you bring your car to us for a service, we look into each component of your vehicle to provide a thorough safety and performance check. The auto service Bournemouth team don’t just look at these main features either. We will go even further and look at parts such as spark plugs, oil and air filters and fuel. Should your oil need changing, we can also do this for a small extra fee. You will also receive expert advice on how to maintain your vehicle to the highest standard for optimum performance. As one of the best auto service Bournemouth choices, we have an intelligent diagnostics system in-house to give your vehicle the most in-depth assessment. Cars these days have so many different technologies that inevitably there are many more problems that can arise. However, with our state-of-the-art diagnostics system, our Bournemouth auto service team are able to keep ahead of the forever changing mechanical trends. With this technology, we can offer vehicle servicing that has an advantage over any other auto service in Bournemouth. The system is able to detect even the most minor faults in all makes and models of cars so that our experts can then provide you with the most reliable solutions. S and H Motors are the leading specialists for Italian cars, and our additional Fiat and Alfa Romeo diagnostics system can help increase the longevity of these vehicles. Our auto service Bournemouth diagnostics are half the cost of main dealers when you bring your vehicle to S and H Motors, so there is no excuse not to get your car checked today. The expert team never cut corners, and always have your safety at the heart of what they do. We want to ensure you get the most out of your car, which is why we always provide honest and impartial advice on how to prolong the lifespan of your vehicle. 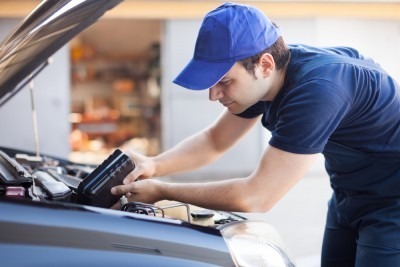 Should our Bournemouth auto service detect any faults during your diagnostics check, we will then provide you with the most suitable solutions for your vehicle. The team at S and H Motors will always give you an upfront quote for any repairs that your card needs and we will supply a full report so that you understand what issues need to be addressed. Our auto service in Bournemouth understand that car repairs seem daunting and costly, but when you bring your car to S and H Motors you will receive a personal customer experience from start to finish. We want to educate our customers on their cars so that they know the signs and symptoms of potential issues to avoid costly repairs in the future. Even if you have the slightest concern, we take each request very seriously at our auto service in Bournemouth. So don’t feel silly about asking us about that rattling noise even if there is no light on your dashboard. We will be happy to put your mind at rest by confirming what the problem is and fixing it for you no matter how big or small. When you bring your vehicle in to S and H Motors you will receive a FREE brake inspection from our auto service Bournemouth team and all repairs come with a 12-month guarantee. Get in touch with us today to book your vehicle in for a service. With over 30 years of experience in the Bournemouth auto service, we are confident in providing you with the highest standard of care for your vehicle; no matter what the make or model. Our professional and friendly engineers and flexible and will be happy to accommodate a service into your schedule. When we show you the report, we will talk you through your car’s overall performance without confusing you with jargon. Our Bournemouth auto service will always give honest advice so that you can make a well-informed decision on your vehicle repairs that suits your needs and budget. Much of our auto service Bournemouth trade comes from recommendations. We endeavour to provide exceptional customer service to each and every one of our customers, and we will never leave you feeling unhappy or uncertain about your vehicle. To find out what our previous customers have to say about us, read our testimonials. If you’re still unsure if our auto service in Bournemouth is right for you, speak to one of our team today. With our low prices including a FREE brake inspections, there really is no excuse not to get your car seen to by one of our Bournemouth auto service experts. For a Bournemouth auto service that won’t let you down, get in touch with S and H Motors today. Call us on 01202 680660 or email us at shmotors@btconnect.com.